Zanies Comedy Club and the Whalen family are working together to raise money to support the Des Plaines Community Foundation at Standup for Des Plaines III, a special comedy night benefit Thursday, April 5, 2018. “This will be the third year of charity event for the Des Plaines Community Foundation,” explained Dan and Jody Whalen. 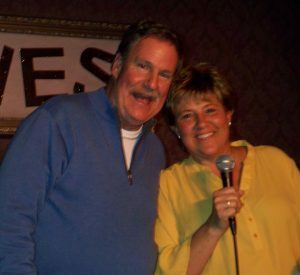 According to the Whalens, who have lived in Des Plaines for 32 years, the profit from last year’s Zanies fundraiser turned out to be nearly $5,000. All went to support the Des Plaines Community Foundation and its programs. 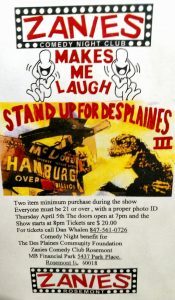 Standup for Des Plaines III will be held at Zanies Comedy Club at 5437 Park Place in Rosemont IL. Tickets are $20. Everyone must be 21 or over with a proper ID. The show starts at 8 p.m. For tickets call Rosemary Argus 847-525-5566 or Dan Whalen 847-561-0726. According to Rosemary Argus, the executive director of the Foundation, the Whalen’s provide a very fun evening and raised a significant amount of funds for the Foundation. “We appreciate their good work,” said Argus. 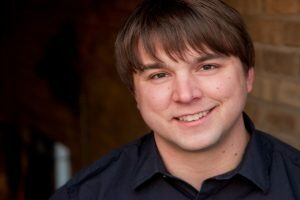 The comedy headliner at Standup for Des Plaines III will be Andy Woodhull with his unique style. Few comedians are lucky enough to make their television debut on Comedy Central’s “Live at Gotham,” but after being invited to perform at Montreal’s “Just For Laughs Comedy Festival” and ‘The Great American Comedy Festival’ in the same year, Andy Woodhull easily earned the distinction. His 2012 album “Lucy” was named among the Top 10 of the Year by comedyreviews.com. He prides himself on his writing and always delivers with hilarious new material. Dan Whalen also plans to do about five minutes of stand-up comedy at the event—reminiscing his younger days when he did open mic night at the old Rosemont COMEDY Cottage in the mid-1980s. Jody Whalen will prepare a dozen or so raffle gift baskets packed with items from local businesses for guests. The baskets will included gift cards and gift certificates. There also will be a “Split-the-Pot” raffle with a $250 prize as well. For more information on becoming volunteer visit: www.DPCharties.org or www.desplainescommunityfoundation.org. Or for more information about Zanies comedy Club go to http://rosemont.zanies.com.